There was an ancient time when people got most of their information from a meager collection of TV channels and a generous supply of paper print publications. The influence of both media sources cannot be underestimated because every person on this planet got their information the same way back in ’69. Earlier generations received their information and subsequent influences via these same two sources, including a barrage of print ads that set the table for them. The battle for buyers was particularly strong in the North American auto industry so Detroit invested heavily in the image wars as it applied to pushing their products. Car jingles with revised lyrics based upon then-current popular music melodies were one way to reach the buying public through TV. 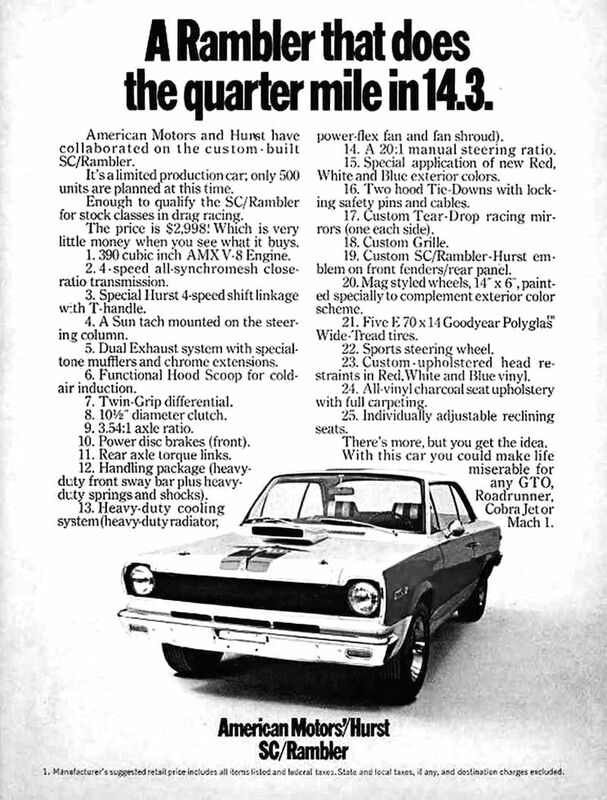 However, print ads in major publications were one of the best ways to reach potential new customers back in ’69. 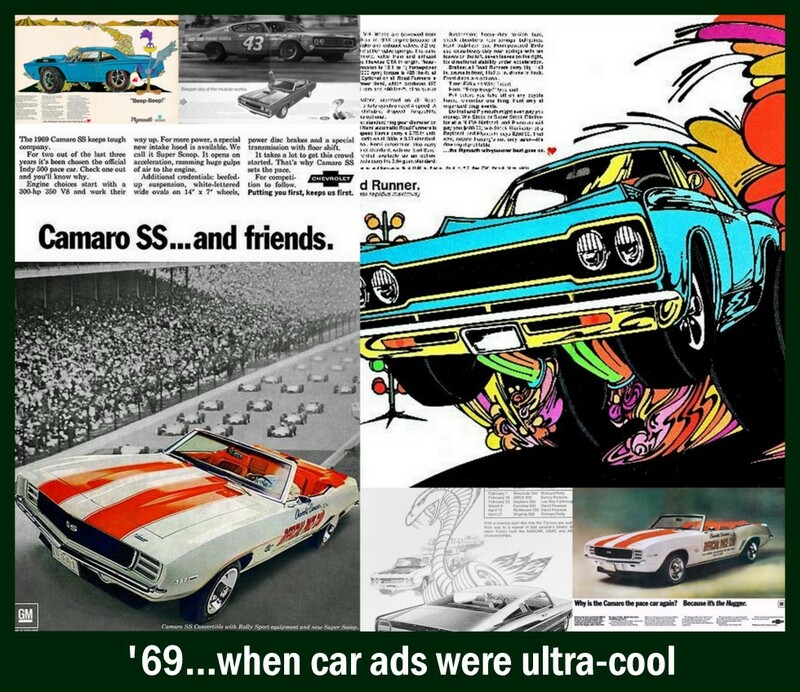 Car makers hired major ad firms (presumably ones with real life Bewitched Larry Tate and Durwood Stevens on their teams) to create magic on paper. 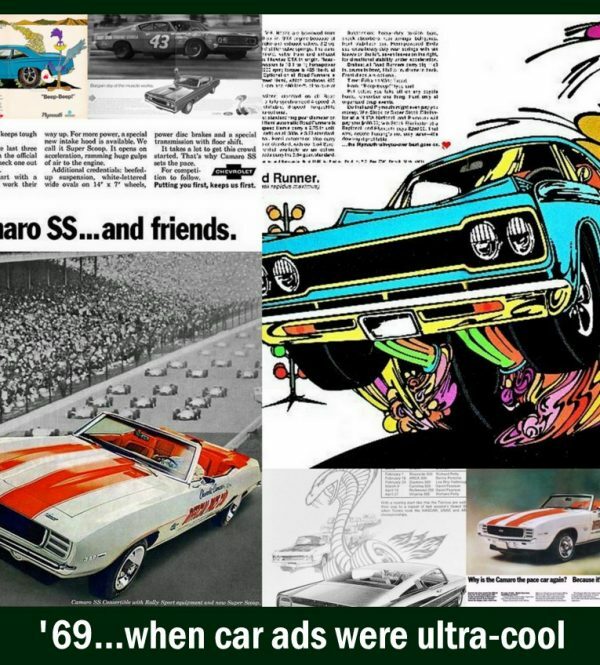 MyStarCollectorCar believes there were more hits than misses in the print ad campaigns put forth by the big players in the game. 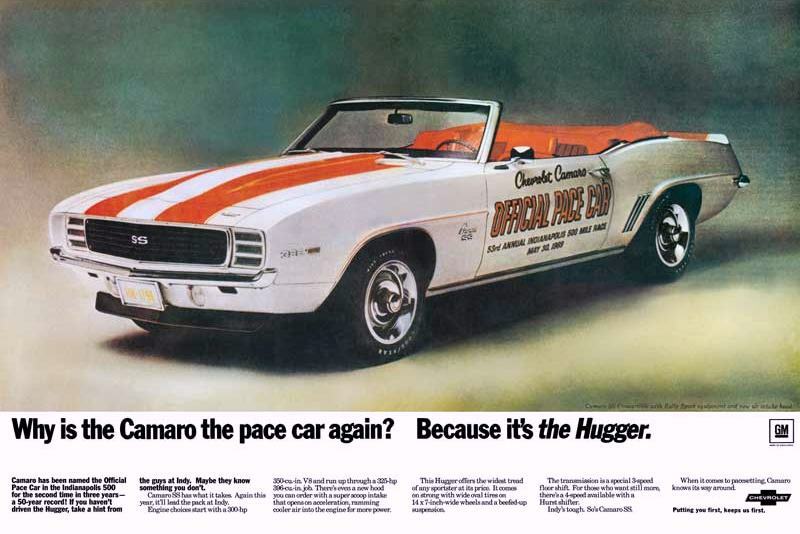 For example, the Chevy Camaro was amply represented by ads like this one where an official Indy 500 pace car version was a prominent star in a print ad with a bold message: Camaro SS…and friends. 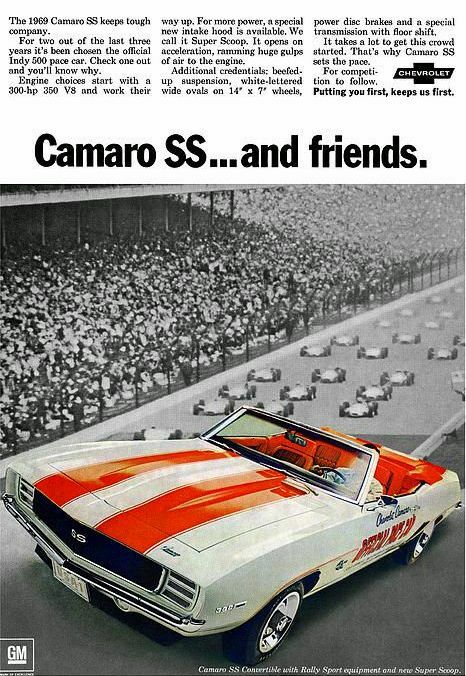 The full color Camaro had a black and white background that featured a full house at the Indianapolis 500 watching some Indy cars. 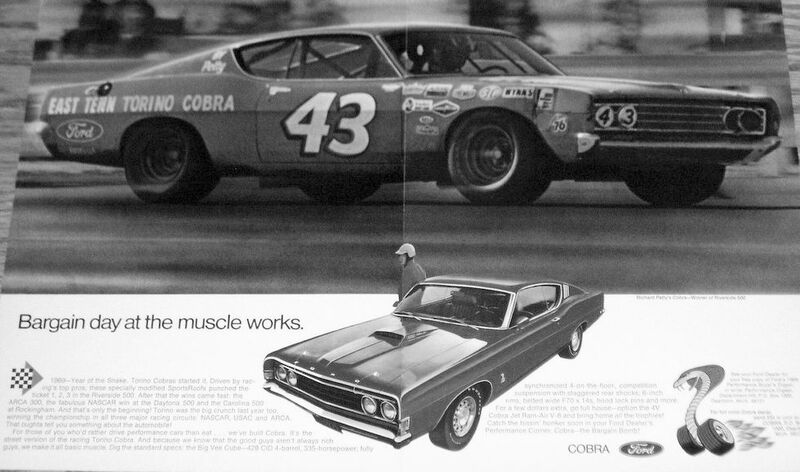 Another ad from arch-rival Ford featured a clever part of auto racing history because the largest image on the page was King Richard Petty behind the wheel of an electric blue 1969 Ford Torino with his famous 43 on its door. Car guys from that era may recall that Petty defected to Ford for the 1969 NASCAR season because he was in the middle of a major dispute with Chrysler at the time. Mopar fans were crushed by Petty’s defection to arch-rival Ford and viewed his decision as an act of automotive treason. Ford felt very differently about Petty’s decision and used the racing legend to reach their potential customers in a huge way with The King driving one of their race cars. The old adage was “Win on Sunday-sell on Monday” and Petty was their meal ticket to bigger sales. 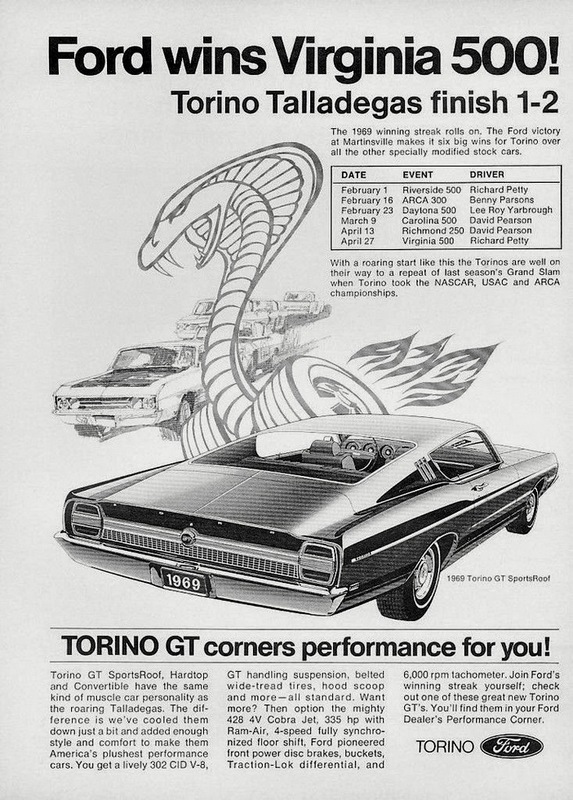 Ford was able to win many races by the time this ad (Bargain day at the muscle works) appeared in magazines, including the 1969 Daytona 500 –– although it was not won by the King that year. That honor went to another race legend by the name of Mario Andretti. But the message in the 1969 Ford ad was clear: We now have King Richard Petty on our team and you can join him if you buy a Ford. 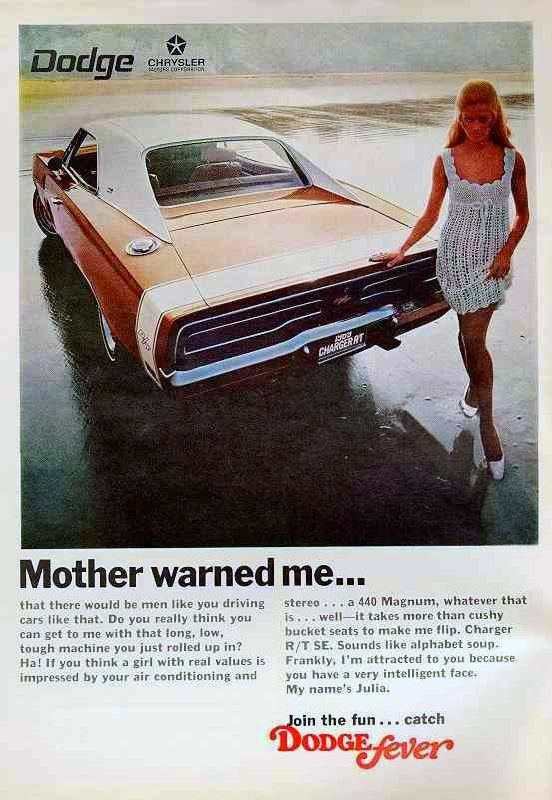 Chrysler may have witnessed the abdication of their king in 1969, but they were more than willing to mix it up with their Big Three rivals any time and any place- whether it was on the street or in a print ad. 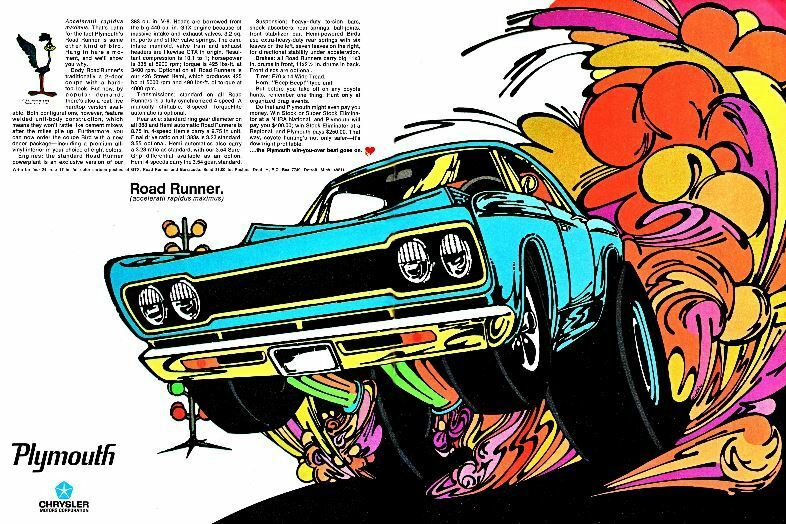 A good example of a Mopar ad was their 1969 Road Runner magazine pitch. The ’68 Road Runner was a runaway hit for Chrysler because it was an affordable muscle car for budget-minded buyers. 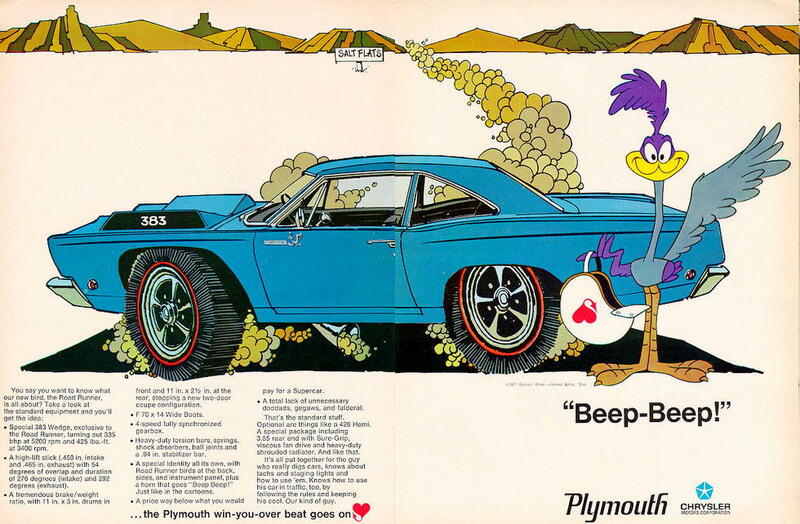 Chrysler parlayed the Road Runner’s success into their 1969 campaign because the new ads played with the notion their dealerships were still the only the only place to catch these very fast automotive birds. Richard Petty may have left the team, but the Mopar boys were still fast and furious in ’69. The late 1960s are famous for their take-no-prisoners muscle car wars from that golden automotive era. But make no mistake-some of the bloodiest conflicts took place in print ads.